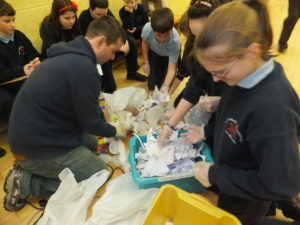 Wicklow County Council has held a one day seminar for secondary schools green school committee members on Waste Prevention. The aim was to provide Green School committees with training on waste prevention to help them develop the skills base to implement more effective prevention actions as part of their Green Schools programmes. The event was held in early October 2017 as a Reuse Month event. The seminar involved providing a range speakers for the schools to demonstrate how prevention can be more effectively introduced across themes including Waste, Energy and Water. Green School committee members and coordinators will be the target audience. Wicklow County Council brought in outside expertise to demonstrate how waste prevention can be tackled in an innovative manner in schools. The event had an audience of about 60 students from five secondary schools. Their participation allowed them to develop stronger programmes that will allow them to develop actions that will promote prevention in their schools engaging the wider student populations. After a similar event in 2016, where a refill project was demonstrated successfully, students from one secondary school went on to replicate the project in their school with follow-up surveys indicating that the proportion of students using reuse drink containers in the school increased from 24% to 82% during the project.